To build political power for young people, we work with brands, tech companies, advocates, and nonprofits to meet our generation where we are and engage and empower them to get involved. Everyone has a role to play — join us! Rock the Vote teamed up with Bad Robot to launch the “Be A Voter” GOTV Postcard Campaign. The effort brought together an impressive coalition of media and entertainment partners that engaged employees to send postcards to first-time voters in California that encouraged them to get out and exercise their right to vote in the 2018 primary. IssueVoter is an innovative non-partisan platform that gives everyone a voice in our democracy by making civic engagement accessible, efficient, and impactful. Users select issues they care about then receive customized email alerts before Congress votes on new bills. Each email includes a summary of the bill, what proponents and opponents are saying, and related news for context. Individuals simply click ‘Support’ or ‘Oppose’ to send their opinion directly to their representative. IssueVoter tracks how often people’s elected officials vote their way, helping voters make informed decisions at election time. Sign up for Issue Voter today! Women’s March EMPOWER is an initiative of Women’s March Youth through a coalition with PeaceFirst, Rise To Run, The Gathering For Justice, Rock the Vote and Teen Vogue. Women’s March EMPOWER upholds the Unity Principles of the Women’s March platform. Our goal is to provide young people with the tools needed to create high school and college chapters that guide students in making a positive impact on their community. We believe that the single most powerful act we can do is prepare young people with the skills and commitments to take actions around causes that matter to them with courage, compassion and collaboration. Our goal is to help Young Leaders in starting a high school or college chapter and becoming a leader in their community. 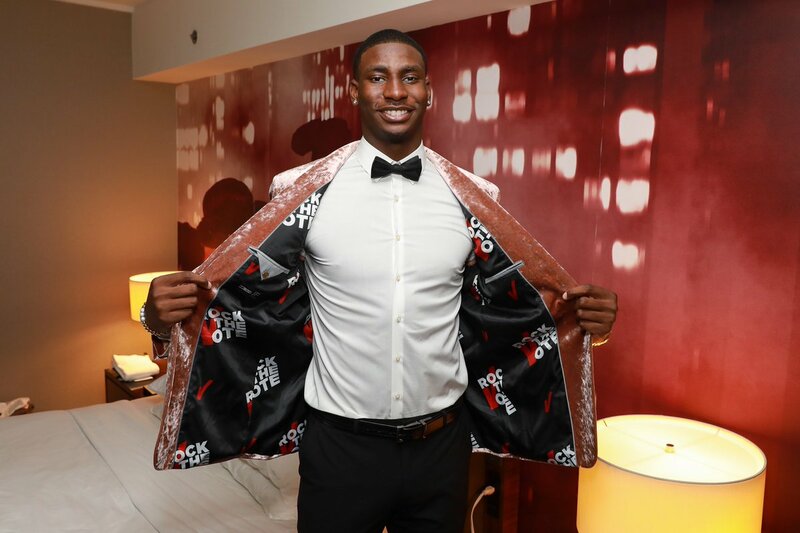 Jaren Jackson Jr., the newest member of the Memphis Grizzlies, showcased his passion for voting on NBA draft night with a custom Rock the Vote lined jacket. We’re excited to continue working with Jaren as he uses his platform to encourage other young people to register and vote. Pennsylvania Voice and Rock the Vote, worked closely together to release a free Pennsylvania Voter Registration App, the first of it’s kind. The Pennsylvania Voter Registration App is unique in that it works without internet access, providing constant access to electronic voter registration without the need for WiFi or a data plan. Additionally, it allows citizens to sign their voter registration application with a stylus, thus allowing the first truly seamless voter registration system in the country. Rock the Vote teamed up with ACLU of California, United Way of Greater Los Angeles, Mobilize the Immigrant Vote and more organizations to launch an issue first voter guide for the June 5th California primary election. The guide featured video and written responses from candidates for Senator Governor, Lt. Governor and Attorney General, and all statewide offices, on priority issues for young voters including college affordability, women’s healthcare, the economy, immigration and climate change. Rock the Vote and Teaching Tolerance, a project of the Southern Poverty Law Center, are working closely together to relaunch Democracy Class, a civic education curriculum created by Rock the Vote in 2010. Democracy Class is a free, nonpartisan curriculum that educates high school students about the importance and history of voting, demystifies how our voting process works, and pre-registers and registers them to vote. Through Rock the Vote’s partnership with Teaching Tolerance, the updated and expanded Democracy Class is designed to be inclusive and is geared toward today’s diverse generation of young people. Sign up to be an official partner or advocate for youth engagement!